As far as I know there are no photographs of me holding Calvin the day he was born, a Saturday. 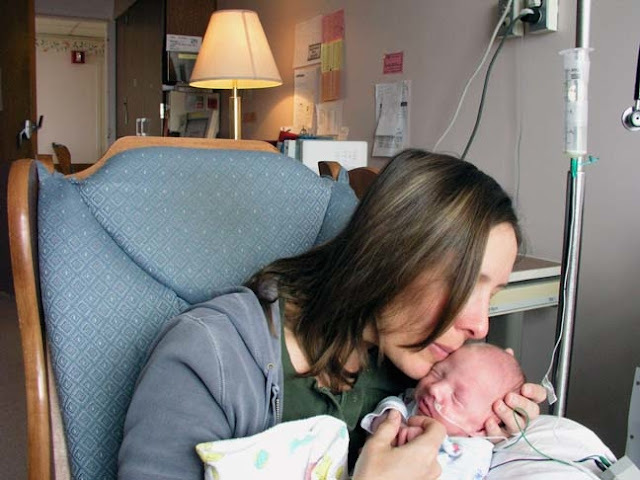 Having arrived six weeks early and missing much of the white matter in his brain, he spent his first week in the neonatal intensive care unit where I held him infrequently, if memory serves. He was so fragile and "floppy," suffered from tachycardia and needed help breathing. I feared I would break or smother him. Michael did not take parental leave (I can't recall if it was available to fathers then) so he returned to work the following Monday to teach his college students the art of photography. Around the same time, I was released from the hospital to continue recovering from an emergency C-section. While Calvin remained in the hospital, Michael and I spent nights at the Ronald McDonald House three blocks away, and passed most of our waking hours tending to Calvin in the hospital nursery. The photo below was taken when Calvin was two or three weeks old. He was not stabile enough to bring home until seven weeks after he was born. Today, on Calvin's fourteenth birthday, he suffered a grand mal seizure at three a.m., just a few days since his last one. I had begun writing this post yesterday, saying that I had a good feeling about February, in part because Calvin had not had any partial complex seizures since I'd dropped his Keppra dose back down a couple of weeks ago. This morning, however, in the wake of the grand mal he had a partial complex seizure in Michael's arms, one long enough for his lips to turn ever-so-slightly blue. Unlike most parents who seem astonished at how quickly their children grow up, it's not hard for us to believe that Calvin is fourteen. Every year has been an arduous struggle, every milestone no matter how small has been years in the making, his development nearly plateaued. Every second expands into a sea of monotony. What is amazing to me is that Calvin survived his birth and has made it this far. Fourteen is somehow special and simultaneously frightening to me. I know several parents whose children with epilepsy have died around this age. One drown during a seizure. Two died from pneumonia. A forth died from Sudden Unexplained Death in Epilepsy (SUDEP). A fifth succumbed to other complications from epilepsy. I am sure there are others who will come to mind later. I'll be keeping our boy home from school again today. Michael just left to go pick up Calvin's birthday cake—carrot with cream cheese frosting—from a special bakery in town. Calvin will love the taste but will have no clue that it is his birthday. In two-and-a-half weeks he will take his last dose of Onfi, the benzodiazepine he needed to help get him off of the first benzo, Klonopin, that he was regrettably and unnecessarily put on when he was three. I'll keep looking for new remedies and hoping he'll make it to fifteen, which will no doubt prove to be light years away. Epilepsy is a dreadful, heartbreaking, life-wasting disease. If you can manage it, please consider donating to CURE epilepsy in honor of Calvin's birthday by clicking here. Oh sweet Christy — may Calvin’s day be filled with joy. He was a beautiful baby. Happy late birthday, Calvin! He must be so big now, been awhile since we've all seen each other. big hugs to you all!